NEST cot was created with love for our little ones. We not only created cot which meets EU safety regulations but went extra mile by making all construction parts (even non-use ones) safe with all edges rounded and sanded by hand. For extra touch we use only natural and non-allergenic oil waxes for impregnating. All surfaces are sanded by hand to achieve this smooth and delicate to touch finish. With SAFE and ECO friendly NEST you can sleep well and your toddler too! . But that’s NOT ALL! 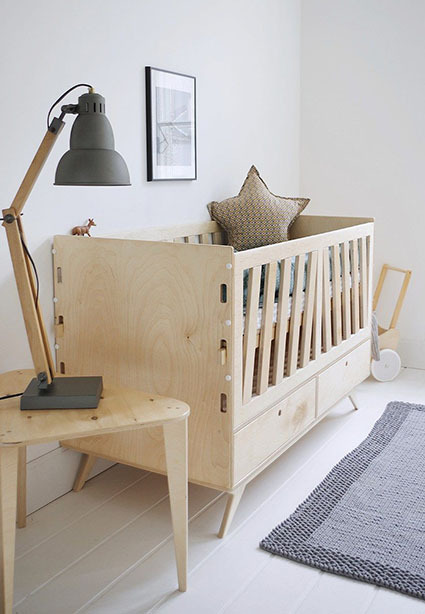 Our cot is designed to grow together with your baby up to age of 4 years! Depending on your needs and age of the toddler, you can easily adjust the level of the mattress in an easy and intuitive way without using any tools. You can also dismantle one or two walls and create a fully-fledged bed when your baby gets bigger. NEST bed will serve the child up to 4 years of age. Two spacious drawers can be used for sheets or as storage for all your little things. NEST baby bed you can assemble it yourself fallowing simple instruction guide.